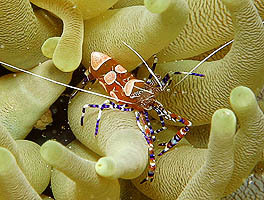 Spotted Cleaner Shrimp are one of the few animals that can live among the stinging tentacles of the Giant Anemone. Click here to see this tiny Shrimp up close! 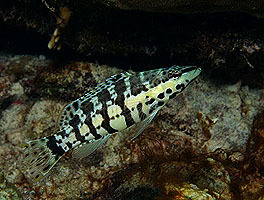 The Harlequin Bass is a small, sleek, and speedy fish often seen around the corals in the shallows. Click here to learn about this flamboyant fish.